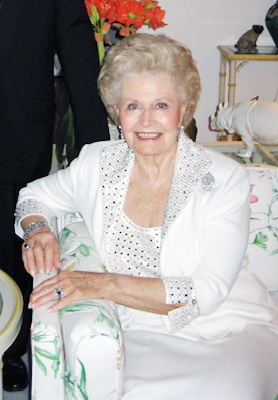 Manalapan, Florida- Sarah (Sally) Cawood Roberts, age 89, passed away on Sunday, January 6, 2019, after a courageous fight with lung disease. Loving wife of the late John M. Roberts IV, she spent a joyous holiday season with her children, grandchildren and great grandchildren. The quintessential artist, she spent her life showering her family and friends with exquisite works of art. She was the loving and caring mother of Alexandria Roberts Daubert (John Thomas Daubert) of Lincoln, Nebraska; Dr. John M. Roberts V (Susan Merten Roberts) of Cincinnati, Ohio; Richard C. Roberts (Sandra Marhoefer Roberts) of Sewickley, PA; and Loughrey Henderson Roberts of West Palm, Beach Florida. She was a selfless individual who truly enjoyed life and brought everyone along on her wonderful voyage. Her life was a whirlwind of family, friends, world-wide travel and of artistic genius. Her creative talents, enthusiasm for life, and love of travel carry on in her eight grandchildren, her eight great grandchildren and all those she touched. Viewing will at the home of Richard and Sandy Roberts 525 Academy Ave, Sewickley Pa., on Saturday, January 19 from 9:30am to 10:30am. All are welcomed. This will be followed by services starting at 11`:00am at The Presbyterian Church, 414 Grant Street, Sewickley. Interment service at 12:00 noon at Sewickley Cemetery, 501 Hopkins Street, Sewickley. All are welcome to a celebratory gathering at 1:00 pm at the Allegheny Country Club, 250 Country Club Road following the burial. In lieu of flowers, please consider a donation to Tuition Mission Foundation, Box 458, East Liverpool, Ohio 43920/www.TuitionMissionFoundation.com.